Two of the three main candidates in the disputed presidential election in Haiti have rejected a proposed recount of the first-round votes. The recount was announced after days of street protests by opposition supporters. Front-runner Mirlande Manigat said the Haitian electoral council had not come up with clear procedures or a timetable. 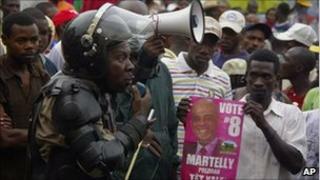 The proposal was also rejected by Michel Martelly, who came third. Mr Martelly said he would not accept a recount conducted by the same group that, he alleges, manipulated the results in the first place. He had earlier said that the count was rigged to deny him a second-round run-off place. Governing party candidate Jude Celestin, who came second and is therefore through to the next round, said he supported the proposal for a recount. Election results announced on Tuesday gave 31% to the former first lady, Ms Manigat, and 22% to Mr Celestin. Mr Martelly came third with 21%, about 6,800 votes short of Mr Celestin. On Thursday, election officials announced they would hold an immediate vote recount in the presence of all top three candidates and international observers.